Hello, my name is Liam. Firstly I would like to introduce myself. I am currently studying Marine Science in NUIG. 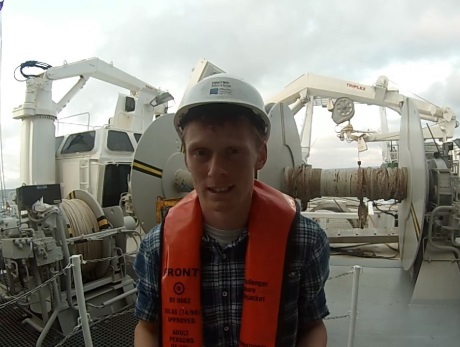 My project on this research vessel is to assess the differing characteristics of ocean dynamic features, specifically internal waves, around coral mounds compared to those around non coral sites at the continental shelf west of Ireland. Our proposed route is as seen below, but has come under continued revision due to variable weather conditions. If the swell is too large, then equipment simply cannot be deployed safely over the side of the ship. We lost communications connection with internet on our way to the Hatton Rockall Basin on Monday morning (a common problem at sea) so there is a lot to catch up on. Once we arrived at the first station, all hands were on deck as we prepared the first CTD dives and the first ROV (Remote Operated Vehicle) dive. The tech team ironed out the usual first deployment kinks, and we have had 3 successful ROV dives to the Hatton Rockall Basin sea floor. 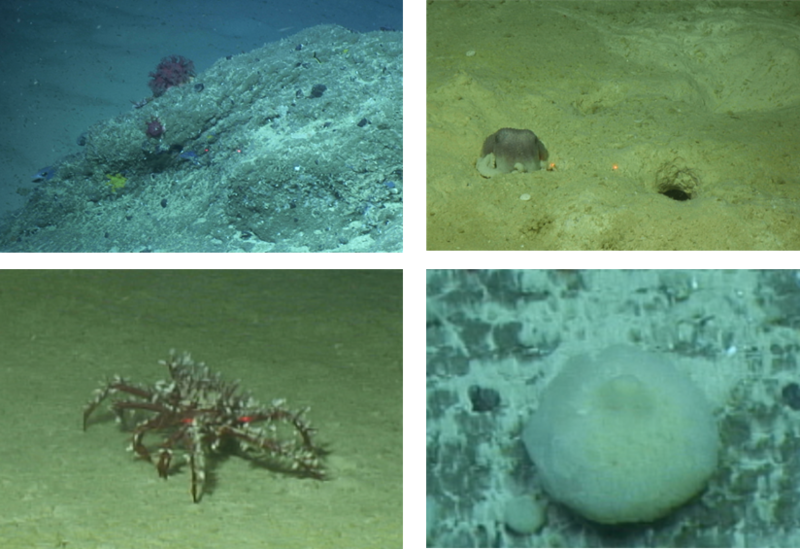 During the ROV dives we encountered a host of interesting specimens inhabiting muddy and rocky substrates at depths from 1100-1300m. These have included species of crustacean, fish, sponge, cephalopod and cnidarian. After the last ROV dive at the Hatton Rockall Basin, early Monday morning, the weather took a turn for the worse. A 3m swell filled in and was moving the boat so much that the ROV could not be deployed. The weather forecast predicted that the bad weather would persist for the next two days, so between the head scientists and the captain the decision was made to retreat from impending storm and travel SE, across the Rockall Trough, to the calmer waters (currently) and coral reefs of the Porcupine Bank. 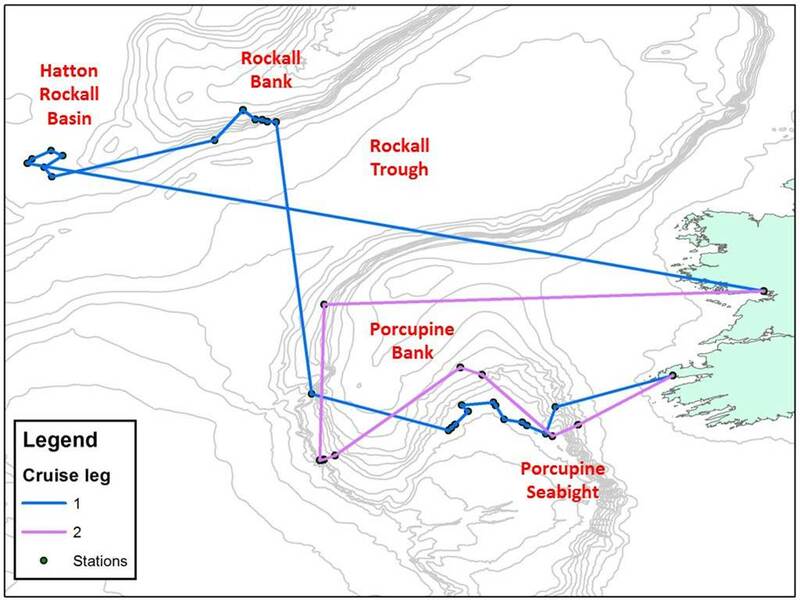 Sadly this has meant that we missed the opportunity to observe the Rockall Bank stations which have notably rich and vibrant coral and sponge communities. For those of you who don’t know, the CTD dives make hydrographic observations of a vertical water column beneath the research ves­­sel. These observations are made by the SBE32 Rosette system. This CTD has two functions; water sampling and hydrographic data measurements. The Rosette CTD system drops to within metres of the sea floor, making measurements of the temperature, salinity, density, light attenuation coefficient, chlorophyll concentration and conductivity of sea water all the way through the water column. On the return journey from the deep, 24 10l bottles take water samples at depths of special interest. There are various projects happening on board that use these water samples, including measuring traces of Radium and Radon isotopes, analysing the optical characteristics of coloured dissolved organic material, and using the flow cytometer to analyse picoplankton distributions. The last CTD deployment was the deepest of our trip, dropping to a depth of 3210m. This dive was situated on the south-eastern side of the Rockall Trough. 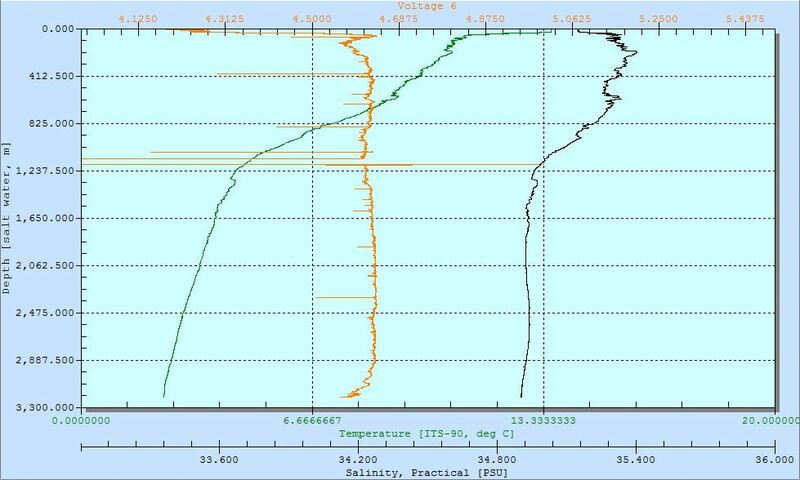 Profiles of salinity, temperature and beam attenuation coefficient (Voltage 6) with depth are seen in the graph below. Apart from the science, we have all been having a great time admiring the deep ocean critters between the rough spells in weather. Lots of dolphin and some pilot whales have even made an appearance which has been a great pleasure. Notably, there is a bulge in the salinity profile at 2.5km depth. This is representative of the intermediate depth intrusion of cold, low salinity Labrador Sea Water. This water was cooled by winter sea ice in the Labrador Sea, sank, and spread at depth in an easterly direction. Also the dip in voltage 6 in the bottom few hundred metres represents clouds of suspended particulate matter, above the sea bed. 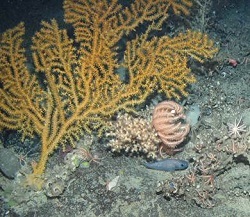 At present, an ROV dive is observing a rich coral reef on the Porcupine Bank. Beautiful corals, sponges, monkfish and more have all been. There is much more to come, so please stay tuned!